Ch 5 10pm 28th ....Strange love. My car is my lover. A revealing examination of the events surrounding the assassination of President John F Kennedy in 1963, including an exploration of some of the conspiracy theories that have emerged over the decades since the infamous shooting in Dallas. This new channel is brill, Arthur C Clark n stuff.. & Karl n Stuart's (from most haunted) new programme about haunted pubs tonight 9pm Paranormal Channel, Sky 212...Whines & Spirits ...for those not glued tae fitba!! A gang insider says: "Anyone whose actually been involved in a gang will tell you you get the love and the affection, you get people, who - as we say on the street - people that's down for you." And he says there is no end in sight to the violence. "These people are recruiting every day. They are getting wider, wider, wider. You'll just get growing numbers of gangs, growing numbers of killings, growing numbers of drugs, you know. You tell me what that's going to lead to - you know, it's going to be a dog eat dog." You can watch Angus Stickler's full report on gangs on Newsnight on Thursday 11 December at 2230 GMT on BBC Two, or catch up on the BBC iPlayer. The War Against Street Weapons. Last year Cherie Booth QC said that the use of street weapons among young people had become so widespread that she feared for the safety of her own children. Since then, the police and government have taken steps to deal with the problem. But are they doing enough? To answer that question, Cherie joins police patrols on Britain's toughest streets, talks to young offenders behind bars, and visits a pioneering scheme combating Glasgow's violent gang culture. With first-hand accounts, Panorama reveals the endless game of cat and mouse between prisoners determined to get their fix and officers equally determined to keep drugs out of their jails. For the first time, visitors are caught on camera passing drugs to their nearest and dearest with hands as fast as any magician. With exclusive access to a Category A jail, reporter Raphael Rowe hears from inmates and officers as well as from smugglers, mules and even a corrupt prison officer, fresh out of jail himself after being caught taking in drugs in return for money. Danny Dyer lives under the roofs of some of the UK's most notorious hard men. Danny Dyer gets under the skin of football hooligan and bouncer Bernard O'Mahoney, who was also a close associate of the infamous gangsters known as the Essex Boys. IN ONE murder after another, Brazil's Canal Livre real-life crime TV show had an uncanny knack of being first on the scene to gather graphic footage. Too uncanny, say police, who are investigating the show's host, state legislator Wallace Souza, on suspicion of ordering at least five murders to boost his ratings and prove his claim that the Amazon region is awash with violence. "The order to execute always came from the legislator and his son, who then alerted the TV crews to get to the scene before the police," police intelligence chief Thomaz Vasconcelos said. Police have also accused Souza of drug-trafficking. Killings of competing traffickers, he said, "appear to have been committed to get rid of rivals and increase the audience of the TV show". Souza denied all the allegations and called them absurd, insisting that he and his son were being set up by political enemies and drug-dealers sick of his two decades of crime coverage and crusading investigations. He said: "I organised legislative inquiries into organised crime, the prison system, corruption, drug-trafficking by police and paedophilia." His lawyer, Francisco Balieiro, said the only witness was a disgraced police officer hoping for leniency in nine murders he is charged with. "There is not one piece of material proof in these accusations," Mr Balieiro said. Mr Vasconcelos said the accusations, which have made headlines in Brazil, stemmed from the testimony of several former employees and security guards who worked with the Souzas, allegedly as part of a gang of former police officers involved in drug-trafficking. Mr Souza's son, Rafael, has been jailed on charges of homicide, drug-trafficking and illegal gun possession. Police said Wallace Souza faced charges of drug-trafficking, gang formation and possessing weapons, but had not been charged with any killings. Souza snr remains free because of immunity that prevents him from being arrested as long as he is an elected representative. He is being investigated by a special task force, and state judicial authorities will decide whether the case goes forward. Mr Vasconcelos said that the crimes appeared to have served the Souzas in two ways: they eliminated drug-trafficking rivals and boosted ratings. "We believe that they organised a kind of death squad to execute rivals who disputed with them the drug-trafficking business," he said. Walter Souza, he added, "would eliminate his rival and use the killing as a news story for his programme". Souza snr became a media personality after a career as a police officer that ended in disgrace, according to Mr Vasconcelos, who said he was fired for involvement in scams involving fuel theft and pension fraud. Souza denied those allegations, but said he was forced to leave the force in 1987 after being wrongly accused of involvement in a college exam fraud scheme that he was investigating. He started Canal Livre two years later on a local commercial station in Manaus, the capital of Brazil's lawless Amazonas state. It became popular with the city's 1.7 million people before going off the air late last year as police intensified their investigation. The show featured Mr Souza, in a studio, railing against rampant crime, punctuated with often exclusive footage of arrests, crime scenes and drug seizures. "When I became a police officer in 1979, bandits weren't raised in this city," he told the audience in one show. Brazil was then a dictatorship, whose police targeted criminals with little concern for civil rights. One clip showed a reporter approaching a freshly burnt corpse, covering his nose with his shirt and breezily remarking: "It smells like barbecue". Police say the victim was one of the five murdered at Souza's behest. Souza denied any role in that killing and explained how his reporters managed to get so quickly to crime scenes, using well-placed sources and monitoring scanners for police radio dispatches. The show also posted workers at police stations and at the Manaus mortuary, where word often came first about newly discovered bodies. "To say that a programme that has had a huge audience for so many years had to resort to killing people to increase this audience is absolutely absurd," Souza said. Police in New York are pioneering a futuristic new crime-fighting system that lets them see surveillance camera images from anywhere in the city and creates an interactive data map revealing arrest figures, license plates and radiation levels - all at the click of a button. 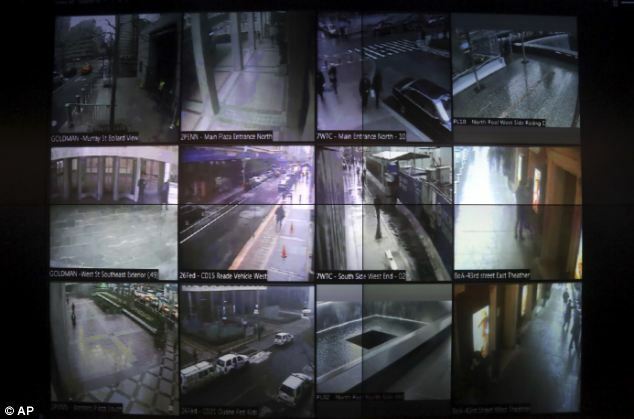 The Microsoft software, called ‘the dashboard’, sends an alert to officers as soon as an emergency call is made and operates a giant video wall that allows cops to watch more than 3,000 cameras city-wide as crimes are unfolding. It has been in use for a year but could now be rolled out to other forces in a move that could make tens of millions of dollars for New York Police Department, which gets a 30 per cent cut of any sales.